Self-esteem is attractive as a social psychological construct because researchers have conceptualized it as an influential predictor of certain outcomes, such as academic achievement, happiness, satisfaction in marriage and relationships, and criminal behaviour. Self-esteem can apply specifically to a particular dimension (for example, "I believe I am a good writer and I feel happy about that") or a global extent (for example, "I believe I am a bad person, and I feel bad about myself in general"). Psychologists usually regard self-esteem as an enduring personality characteristic ("trait" self-esteem), though normal, short-term variations ("state" self-esteem) also exist. Synonyms or near-synonyms of self-esteem include many things: self-worth, self-regard, self-respect, and self-integrity. The identification of self-esteem as a distinct psychological construct is thought[by whom?] to have its origins in the work of philosopher and psychologist, geologist, anthropologist William James (1892). James identified multiple dimensions of the self, with two levels of hierarchy: processes of knowing (called the 'I-self') and the resulting knowledge about the self (the 'Me-self'). Observation about the self and storage of those observations by the I-self create three types of knowledge, which collectively account for the Me-self, according to James. These are the material self, social self, and spiritual self. The social self comes closest to self-esteem, comprising all characteristics recognized by others. The material self consists of representations of the body and possessions, and the spiritual self of descriptive representations and evaluative dispositions regarding the self. This view of self-esteem as the collection of an individual's attitudes toward oneself remains today. In the early 20th century, the behaviorist movement minimized introspective study of mental processes, emotions and feelings, replacing introspection with objective study through experiments on behaviors observed in relation with environment. Behaviorism viewed the human being as an animal subject to reinforcements, and suggested placing psychology as an experimental science, similar to chemistry or biology. As a consequence, clinical trials on self-esteem were overlooked, since behaviorists considered the idea less liable to rigorous measurement. In the mid-20th century, the rise of phenomenology and humanistic psychology led to renewed interest in self-esteem. Self-esteem then took a central role in personal self-actualization and in the treatment of psychic disorders. Psychologists started to consider the relationship between psychotherapy and the personal satisfaction of persons with high self-esteem as useful to the field. This led to new elements being introduced to the concept of self-esteem, including the reasons why people tend to feel less worthy and why people become discouraged or unable to meet challenges by themselves. In 1992 the political scientist Francis Fukuyama associated self-esteem with what Plato called thymos - the "spiritedness" part of the Platonic soul. As of 1997[update] the core self-evaluations approach included self-esteem as one of four dimensions that comprise one's fundamental appraisal of oneself - along with locus of control, neuroticism, and self-efficacy. The concept of core self-evaluations as first examined by Judge, Locke, and Durham (1997), has since proven to have the ability to predict job satisfaction and job performance. Self-esteem may be essential to self-evaluation. Self-esteem was believed[by whom?] to be a cultural phenomenon of Western individualistic societies since low self-esteem was not found in collectivist countries such as Japan. Concern about low self-esteem and its many presumed negative consequences led California assemblyman John Vasconcellos to work to set up and fund the Task Force on Self-Esteem and Personal and Social Responsibility in California in 1986. Vasconcellos argued that this task force could combat many of the state's problems - from crime and teen pregnancy to school underachievement and pollution. He compared increasing self-esteem to giving out a vaccine for a disease: it could help protect people from being overwhelmed by life's challenges. The task force set up committees in many California counties and formed a committee of scholars to review the available literature on self-esteem. This committee found very small associations between low self-esteem and its assumed consequences, ultimately showing that low self-esteem is not the root of all societal problems and not as important as the committee had originally thought. However, the authors of the paper that summarized the review of the literature still believe that self-esteem is an independent variable that affects major social problems. The task force disbanded in 1995, and the National Council for Self-Esteem and later the National Association for Self-Esteem (NASE) was established,[by whom?] taking on the task force's mission. Vasconcellos and Jack Canfield were members of its advisory board in 2003, and members of its Masters' Coalition included Anthony Robbins, Bernie Siegel, and Gloria Steinem. Self-esteem is important because it shows us how we view the way we are and the sense of our personal value. Thus, it affects the way we are and act in the world and the way we are related to everybody else. One of the most widely used instruments, the Rosenberg self-esteem scale (RSES) is a 10-item self-esteem scale score that requires participants to indicate their level of agreement with a series of statements about themselves. An alternative measure, The Coopersmith Inventory uses a 50-question battery over a variety of topics and asks subjects whether they rate someone as similar or dissimilar to themselves. If a subject's answers demonstrate solid self-regard, the scale regards them as well adjusted. If those answers reveal some inner shame, it considers them to be prone to social deviance. During school-aged years, academic achievement is a significant contributor to self-esteem development. Consistently achieving success or consistently failing will have a strong effect on students' individual self-esteem. Social experiences are another important contributor to self-esteem. As children go through school, they begin to understand and recognize differences between themselves and their classmates. Using social comparisons, children assess whether they did better or worse than classmates in different activities. These comparisons play an important role in shaping the child's self-esteem and influence the positive or negative feelings they have about themselves. As children go through adolescence, peer influence becomes much more important. Adolescents make appraisals of themselves based on their relationships with close friends. Successful relationships among friends are very important to the development of high self-esteem for children. Social acceptance brings about confidence and produces high self-esteem, whereas rejection from peers and loneliness brings about self-doubts and produces low self-esteem. A person can have a high self-esteem and hold it confidently where they do not need reassurance from others to maintain their positive self view, whereas others with defensive high self-esteem may still report positive self-evaluations on the Rosenberg Scale, as all high self-esteem individuals do; however, their positive self-views are fragile and vulnerable to criticism. Defensive high self-esteem individuals internalize subconscious self-doubts and insecurities, causing them to react very negatively to any criticism they may receive. There is a need for constant positive feedback from others for these individuals to maintain their feelings of self-worth. The necessity of repeated praise can be associated with boastful, arrogant behavior or sometimes even aggressive and hostile feelings toward anyone who questions the individual's self-worth, an example of threatened egotism. Low self-esteem can result from various factors, including genetic factors, physical appearance or weight, mental health issues, socioeconomic status, significant emotional experiences, peer pressure or bullying. The individual does not regard themselves as valuable or lovable. They may be overwhelmed by defeat, or shame, or see themselves as such, and they name their "anti-feat". For example, if they consider that being over a certain age is an anti-feat, they define themselves with the name of their anti-feat, and say, "I am old". They express actions and feelings such as pity, insulting themselves, and they may become paralyzed by their sadness. People with strong self-esteem have a positive self-image and enough strength so that anti-feats do not subdue their self-esteem. They have less fear of failure. These individuals appear humble, cheerful, and this shows a certain strength not to boast about feats and not to be afraid of anti-feats. They are capable of fighting with all their might to achieve their goals because, if things go wrong, their self-esteem will not be affected. They can acknowledge their own mistakes precisely because their self-image is strong, and this acknowledgment will not impair or affect their self-image. They live with less fear of losing social prestige, and with more happiness and general well-being. However, no type of self-esteem is indestructible, and due to certain situations or circumstances in life, one can fall from this level into any other state of self-esteem. ^ a b c Smith, E. R.; Mackie, D. M. (2007). Social Psychology (Third ed.). Hove: Psychology Press. ISBN 978-1-84169-408-5. ^ a b c d e f g h i j k Baumeister, R. F.; Campbell, J. D.; Krueger, J. I.; Vohs, K. D. (2003). "Does High Self-Esteem Cause Better Performance, Interpersonal Success, Happiness, or Healthier Lifestyles?". Psychological Science in the Public Interest. 4 (1): 1–44. doi:10.1111/1529-1006.01431. ISSN 1529-1006. PMID 26151640. ^ a b c d e f g h i j k Orth U.; Robbins R.W. (2014). "The development of self-esteem". Current Directions in Psychological Science. 23 (5): 381–387. doi:10.1177/0963721414547414. ^ "Great Books Online -- Quotes, Poems, Novels, Classics and hundreds more". Bartleby.com. Archived from the original on 25 January 2009. Retrieved 11 December 2017. ^ "Bartleby.com: Great Books Online -- Quotes, Poems, Novels, Classics and hundreds more". Bartleby.com. Archived from the original on 25 January 2009. Retrieved 11 December 2017. ^ "Great Books Online -- Quotes, Poems, Novels, Classics and hundreds more". Bartleby.com. Archived from the original on 24 January 2009. Retrieved 11 December 2017. ^ The Macquarie Dictionary. Compare The Dictionary of Psychology by Raymond Joseph Corsini. Psychology Press, 1999. ISBN 1-58391-028-X. Online via Google Book Search. ^ a b James, W. (1892). Psychology: The briefer course. New York: Henry Holt. ^ a b Baumeister, Roy F.; Smart, L.; Boden, J. (1996). "Relation of threatened egotism to violence and aggression: The dark side of self-esteem". Psychological Review. 103 (1): 5–33. CiteSeerX 10.1.1.1009.3747. doi:10.1037/0033-295X.103.1.5. PMID 8650299. ^ a b c d e f g h i j k l m n o p q r s t u v w x y z José-Vicente Bonet. Sé amigo de ti mismo: manual de autoestima. 1997. Ed. Sal Terrae. Maliaño (Cantabria, España). ISBN 978-84-293-1133-4. ^ Fukuyama, Francis (1992). The End of History and the Last Man. New York: Simon and Schuster (published 2006). p. xvi - xvii. ISBN 9780743284554. Retrieved 2018-07-29. [...] Plato in the Republic [...] noted that there were three parts to the soul, a desiring part, a reasoning part, and a part that he called thymos, or 'spiritedness.' [...] The propensity to feel self-esteem arises out of the part of the soul called thymos. ^ a b c Judge, T. A.; Locke, E. A.; Durham, C. C. (1997). "The dispositional causes of job satisfaction: A core evaluations approach". Research in Organizational Behavior. 19: 151–188. ^ a b Judge, T. A.; Locke, E. A.; Durham, C. C.; Kluger, A. N. (1998). "Dispositional effects on job and life satisfaction: The role of core evaluations". Journal of Applied Psychology. 83 (1): 17–34. doi:10.1037/0021-9010.83.1.17. PMID 9494439. ^ Heine S. J.; Lehman D. R.; Markus H. R.; Kitayama S. (1999). "Is there a universal need for positive self-regard?". Psychological Review. 106 (4): 766–794. CiteSeerX 10.1.1.321.2156. doi:10.1037/0033-295X.106.4.766. PMID 10560328. 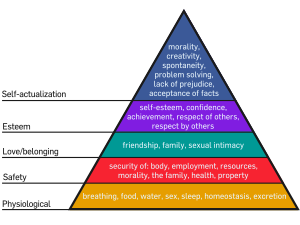 ^ Maslow, A. H. (1987). Motivation and Personality (Third ed.). New York: Harper & Row. ISBN 978-0-06-041987-5. ^ Wickman S.A.; Campbell C. (2003). "An analysis of how Carl Rogers enacted client-centered conversation with Gloria". Journal of Counseling & Development. 81 (2): 178–184. doi:10.1002/j.1556-6678.2003.tb00239.x. ^ "MacArthur SES & Health Network - Research". Macses.ucsf.edu. Retrieved 11 December 2017. ^ Slater, Lauren (3 Feb 2002). "The Trouble With Self-Esteem". The New York Times. Retrieved 27 Nov 2012. ^ Bosson J.K.; Swann W.B. ; Pennebaker J.W. (2000). "Stalking the perfect measure of implicit self esteem: The blind men and the elephant revisited?". Journal of Personality & Social Psychology. 79 (4): 631–643. CiteSeerX 10.1.1.371.9919. doi:10.1037/0022-3514.79.4.631. ^ Koole, S. L., & Pelham, B. W. (2003). On the nature of implicit self-esteem: The case of the name letter effect. In S. Spencer, S. Fein, & M. P. Zanna (Eds. ), Motivated social perception: The Ontario Symposium (pp. 93–116). Hillsdale, NJ: Lawrence Erlbaum. ^ Hetts J.J.; Sakuma M.; Pelham B.W. (1999). "Two roads to positive regard: Implicit and explicit self-evaluation and culture". Journal of Experimental Social Psychology. 35 (6): 512–559. doi:10.1006/jesp.1999.1391. ^ a b Raboteg-Saric Z.; Sakic M. (2014). "Relations of parenting styles and friendship quality to self-esteem, life satisfaction, & happiness in adolescents". Applied Research in the Quality of Life. 9 (3): 749–765. doi:10.1007/s11482-013-9268-0. ^ Olsen, J. M.; Breckler, S. J.; Wiggins, E. C. (2008). Social Psychology Alive (First Canadian ed.). Toronto: Thomson Nelson. ISBN 978-0-17-622452-3. ^ Coopersmith, S. (1967). The Antecedents of Self-Esteem. New York: W. H. Freeman. ^ Isberg, R. S.; Hauser, S. T.; Jacobson, A. M.; Powers, S. I.; Noam, G.; Weiss-Perry, B.; Fullansbee, D. (1989). "Parental contexts of adolescent self-esteem: A developmental perspective". Journal of Youth and Adolescence. 18 (1): 1–23. doi:10.1007/BF02139243. PMID 24271601. ^ Lamborn, S. D.; Mounts, N. S.; Steinberg, L.; Dornbusch, S. M. (1991). "Patterns of Competence and Adjustment among Adolescents from Authoritative, Authoritarian, Indulgent, and Neglectful Families". Child Development. 62 (5): 1049–1065. doi:10.1111/j.1467-8624.1991.tb01588.x. PMID 1756655. ^ "Self-Esteem." Self-Esteem. N.p., n.d. Web. 27 Nov. 2012. ^ Crocker, J.; Sommers, S. R.; Luhtanen, R. K. (2002). "Hopes Dashed and Dreams Fulfilled: Contingencies of Self-Worth and Graduate School Admissions". Personality and Social Psychology Bulletin. 28 (9): 1275–1286. doi:10.1177/01461672022812012. ^ Butler, R. (1998). "Age Trends in the Use of Social and Temporal Comparison for Self-Evaluation: Examination of a Novel Developmental Hypothesis". Child Development. 69 (4): 1054–1073. doi:10.1111/j.1467-8624.1998.tb06160.x. PMID 9768486. ^ Pomerantz, E. M.; Ruble, D. N.; Frey, K. S.; Grenlich, F. (1995). "Meeting Goals and Confronting Conflict: Children's Changing Perceptions of Social Comparison". Child Development. 66 (3): 723–738. doi:10.1111/j.1467-8624.1995.tb00901.x. PMID 7789198. ^ Thorne, A.; Michaelieu, Q. (1996). "Situating Adolescent Gender and Self-Esteem with Personal Memories". Child Development. 67 (4): 1374–1390. doi:10.1111/j.1467-8624.1996.tb01802.x. PMID 8890489. ^ Leary, M. R.; Baumeister, R. F. (2000). "The Nature and Function of Self-Esteem: Sociometer Theory". In Zanna, M. P. (ed.). Advances in Experimental Social Psychology. 32. San Diego, CA: Academic Press. pp. 1–62. ISBN 978-0-12-015232-2. ^ Erol, R. Y.; Orth, U. (2011). "Self-Esteem Development From Age 14 to 30 Years: A Longitudinal Study". Journal of Personality and Social Psychology. 101 (3): 607–619. doi:10.1037/a0024299. PMID 21728448. ^ Maldonado L.; Huang Y.; Chen R.; Kasen S.; Cohen P.; Chen H. (2013). "Impact of early adolescent anxiety disorders on self-esteem development from adolescence to young adulthood". Journal of Adolescent Health. 53 (2): 287–292. doi:10.1016/j.jadohealth.2013.02.025. PMC 3725205. PMID 23648133. ^ Ehrenreich, Barbara (January 2007). Patterns for college Writing (12th ed.). Boston: Bedford/St. Martin's. p. 680. ^ Gruenewald T.L. ; Kemeny M.E. ; Aziz N.; Fahey J.L. (2004). "Acute threat to the social self: Shame, social self-esteem, and cortisol activity". Psychosomatic Medicine. 66 (6): 915–924. CiteSeerX 10.1.1.505.5316. doi:10.1097/01.psy.0000143639.61693.ef. PMID 15564358. ^ Johnson E.A. ; O'Brien K.A. (2013). "Self-compassion soothes the savage ego-threat system: Effects on negative affect, shame, rumination, & depressive symptoms". Journal of Social and Clinical Psychology. 32 (9): 939–963. doi:10.1521/jscp.2013.32.9.939. ^ In a survey on technology 60% of people using social media reported that it has impacted their self-esteem in a negative way. ^ a b Power, F. Clark; Khmelkov, Vladimir T. (1998). "Character development and self-esteem: Psychological foundations and educational implications". International Journal of Educational Research. 27 (7): 539–551. doi:10.1016/S0883-0355(97)00053-0. ^ Adapted from Hamachek, D. E. (1971). Encounters with the Self. New York: Rinehart. ^ a b "KidsHealth." Developing Your Child's Self-Esteem. N.p., n.d. Web. 27 Nov. 2012. <http://kidshealth.org/parent/emotions/feelings/self_esteem.html>. ^ Jordan, C. H.; Spencer, S. J.; Zanna, M. P. (2003). "'I love me...I love me not': Implicit self-esteem, explicit self-esteem and defensiveness". In Spencer, S. J.; Fein, S.; Zanna, M. P.; Olsen, J. M. (eds.). Motivated social perception: The Ontario symposium. 9. Mahwah, NJ: Erlbaum. pp. 117–145. ISBN 978-0-8058-4036-0. ^ Jordan, C. H.; Spencer, S. J.; Zanna, M. P.; Hoshino-Browne, E.; Correll, J. (2003). "Secure and defensive high self-esteem". Journal of Personality and Social Psychology. 85 (5): 969–978. doi:10.1037/0022-3514.85.5.969. PMID 14599258. ^ Barbara Krahe, The Social Psychology of Aggression (Psychology Press, 2013), 75. ^ Sedikieds, C.; Rudich, E. A.; Gregg, A. P.; Kumashiro, M.; Rusbult, C. (2004). "Are normal narcissists psychologically healthy? Self-esteem matters". Journal of Personality and Social Psychology. 87 (3): 400–416. doi:10.1037/0022-3514.87.3.400. PMID 15382988. ^ "Narcissism vs. Authentic Self-Esteem". afterpsychotherapy.com. 17 January 2011. Retrieved 22 October 2017. ^ Morf, C. C.; Rhodewalk, F. (1993). "Narcissism and self-evaluation maintenance: Explorations in object relations". Personality and Social Psychology Bulletin. 19 (6): 668–676. doi:10.1177/0146167293196001. ^ Twenge, J. M.; Campbell, W. K. (2003). "'Isn't it fun to get the respect we're going to deserve?' Narcissism, social rejection, and aggression". Personality and Social Psychology Bulletin. 29 (2): 261–272. doi:10.1177/0146167202239051. PMID 15272953. ^ Jones FC (2003). "Low self esteem". Chicago Defender. p. 33. ISSN 0745-7014. ^ Adapted, Gill J. "Indispensable Self-Esteem". Human Development. 1: 1980. ^ Baldwin, M. W.; Sinclair, L. (1996). "Self-esteem and 'if...then' contingencies of interpersonal acceptance". Journal of Personality and Social Psychology. 71 (6): 1130–1141. doi:10.1037/0022-3514.71.6.1130. PMID 8979382. ^ a b c Monografias.com, Darcy Leiva. "Como influye el genero en la Autoestima de los Adolescentes - Monografias.com". Monografias.com. Retrieved 11 December 2017. ^ "Contingent Synonyms, Contingent Antonyms - Thesaurus.com". thesaurus.com. Retrieved 22 October 2017. ^ "Unconditional". The Free Dictionary. Retrieved 11 December 2017. ^ Victoria Blom. ""Striving for Self-esteem" (Department of Psychology, Stockholm University, 2011)" (PDF). p. 17. ^ a b "The Boom and Bust Ego". Psychology Today. Retrieved 11 December 2017. ^ Paul Tillich, Terry Lectures: Courage to Be (Yale University, 2000) 164. ^ Christopher J. Mruk, Self-esteem Research, Theory, and Practice (Springer, 1995), 88. ^ Terry D. Cooper, Paul Tillich and Psychology: Historic and Contemporary Explorations in Theology, Psychotherapy, and Ethics (Mercer University,2006). 7. ^ "Self-esteem/OKness: a personal story" (PDF). Ahpcc.org.uk. Retrieved 11 December 2017. ^ Terry D. Cooper, Paul Tillich and Psychology: Historic and Contemporary Explorations in Theology, Psychotherapy, and Ethics (Mercer University,2006). 5. ^ "OK". The Free Dictionary. Retrieved 11 December 2017. ^ Thomas A. Harris, I'm OK — You're OK (Harper and Row), 1969, 235. ^ Michael H. Kernis. "Toward a Conceptualization of Optimal Self-Esteem" (PDF). Academic.udayton.edu. Retrieved 11 December 2017. ^ a b c Nathaniel Branden. Cómo mejorar su autoestima. 1987. Versión traducida: 1990. 1ª edición en formato electrónico: enero de 2010. Ediciones Paidós Ibérica. ISBN 978-84-493-2347-8. ^ Christian Miranda. La autoestima profesional: una competencia mediadora para la innovación en las prácticas pedagógicas Archived 2011-07-22 at the Wayback Machine. Revista Iberoamericana sobre Calidad, Eficacia y Cambio en Educación. 2005. Volume 3, number 1. PDF format. ^ World Health Organization (2014). "Preventing suicide: A global imperative". World Health Organization - Mental Health: 92. ^ Schacter, Daniel L.; Gilbert, Daniel T.; Wegner, Daniel M. (2009). "Self Esteem". Psychology (Second ed.). New York: Worth. ISBN 978-0-7167-5215-8. ^ Baumeister, Roy F.; Jennifer D. Campbell, Joachim I. Krueger and Kathleen D. Vohs; Krueger, Joachim I.; Vohs, Kathleen D. (January 2005). "Exploding the Self-Esteem Myth" (PDF). Scientific American. 292 (1): 84–91. Bibcode:2005SciAm.292a..84B. doi:10.1038/scientificamerican0105-84. PMID 15724341. Archived from the original (PDF) on 2 April 2015. Retrieved 20 February 2011. ^ Baumeister, Roy (23 December 2009). "Self-Esteem". Education.com. Retrieved 8 January 2015. ^ Reasoner, Robert W. (n.d.). "research.htm Extending self-esteem theory and research[permanent dead link]." Retrieved February 20, 2011. ^ Ulrich Schimmack and Ed Diener (2003). "Predictive validity of explicit and implicit self-esteem for subjective well-being" (PDF). Journal of Research in Personality. 37 (2): 100–106. doi:10.1016/S0092-6566(02)00532-9. ^ Eaton, J; Wardstruthers, C; Santelli, A (2006). "Dispositional and state forgiveness: The role of self-esteem, need for structure, and narcissism". Personality and Individual Differences. 41 (2): 371–380. doi:10.1016/j.paid.2006.02.005. ISSN 0191-8869. ^ Chavez, Robert S.; Heatherton, Todd F. (April 28, 2014). "Multimodal frontostriatal connectivity underlies individual differences in self-esteem". Social Cognitive and Affective Neuroscience. Oxford University Press. Retrieved July 9, 2015. ^ Ellis, A. (2005). The Myth of Self-esteem. Amherst, NY: Prometheus Books. ISBN 978-1-59102-354-8. ^ PhD, Albert Ellis; PhD, Windy Dryden (31 July 2007). The Practice of Rational Emotive Behavior Therapy: Second Edition. Springer Publishing Company. ISBN 9780826122179. Retrieved 11 December 2017 – via Google Books. ^ Baumeister; Tierney (2011). Willpower: The Greatest's Human Strength. p. 192. ^ Nathaniel Branden, The Six Pillars of Self-esteem (Bantam, 1995), 52. Also see Nathaniel Branden, How to Raise Your Self-Esteem: The Proven Action-Oriented Approach to Greater Self-Respect and Self-Confidence (Random House, 1988), 9. Spanish edition: Cómo mejorar su autoestima (Paidos, 2009). ^ Michaels, M.; Barr, A.; Roosa, M.; Knight, G. (2007). "Self-Esteem: Assessing Measurement Equivalence in a Multiethnic Sample of Youth". Journal of Early Adolescence. 27 (3): 269–295. doi:10.1177/0272431607302009. ^ Erikson, Erik H. (1973). Childhood and Society. Harmondsworth: Penguin. p. 260. ISBN 978-0-14-020754-5. ^ Crompton, Simon (2007). All about Me. London: Collins. p. 16. ISBN 978-0-00-724795-0. ^ Fenichel, Otto (1946). The Psychoanalytic Theory of Neurosis. London. pp. 407–410. ^ Symington, Neville (2003). Narcissism: A New Theory. London: Karmac. p. 114. ISBN 978-1-85575-047-0.